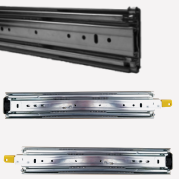 For fire, rescue, and emergency vehicles, cargo vans, maintenance trucks, and utility vehicles we offer high-quality steel, aluminum, and stainless steel drawer slides in various lengths, load requirements and desired reach. From light duty 50 lbs. slides to extra heavy duty 500 lbs. with lock-in /out features, and up to 770 lbs. max load with our super heavy duty industrial slides, we offer an extensive selection. Combine your drawer slide with Austin’s patented Front Drawer Release systems for one-handed solutions designed to secure your drawer slides.